The Zarembinski family (clockwise from lower right): Zach, sister Becca, father Dan and mother Tracy. Photo from his CaringBridge.org page. Less than three weeks after suffering a traumatic brain hemorrhage during a football game, Hill-Murray senior Zach Zarembinski is making progress toward resuming a normal life. The 6-2, 300-pound defensive lineman collapsed in the third quarter of the Pioneers’ loss to St. Paul Johnson on Oct. 27 as the result of bleeding on the brain. The cause is still unknown. He was taken to Regions Hospital in St. Paul, where an emergency craniotomy was performed, removing part of the left side of his skull to allow his brain to swell. He was then put into a medically induced coma. His recovery has progressed well enough since the surgery that Zarembinski was released from the hospital on Nov. 13. Last Wednesday, Zarembinski made an appearance at Hill-Murray. Wearing a helmet to protect the side of his head where the doctors removed a portion of his skull, Zarembinski got a few things from his locker and experienced a pepfest that was going on at the time. “Zach was able to say hi to all the students and thank them for their support. Although he is not back in school yet, the students seemed thrilled to see him!” Becca wrote on his CaringBridge site. 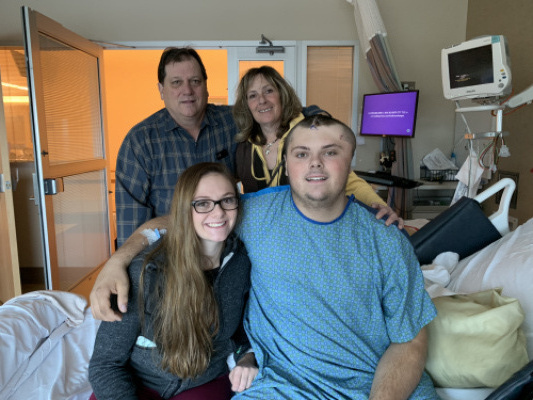 On Friday, Zarembinski and his father went back to Regions Hospital to express their gratitude for everything the staff there had done for him. They met with doctors and medical personnel who treated him and answered questions from various media members. Zarembinski has plenty of doctors to visit and therapy sessions to attend before he can go back to school full time. His days playing contact sports are over, but there is reason to hope he will completely overcome his trauma and resume a normal life. “It takes months to know what full recovery is, but sitting at the table talking with this young man, I would say he's going to do very well,” Dr. David Dries, critical care and trauma surgeon at Regions Hospital, told Fox 9.